The Earth's magnetic field permanently protects us from the charged particles and radiation that originate in the Sun. This shield is produced by the geodynamo, the rapid motion of huge quantities of liquid iron alloy in the Earth's outer core. To maintain this magnetic field until the present day, the classical model required the Earth's core to have cooled by around 3 000 °C over the past 4.3 billion years. Now, a team of researchers from CNRS and Université Blaise Pascal1 suggests that, on the contrary, its temperature has fallen by only 300 °C. 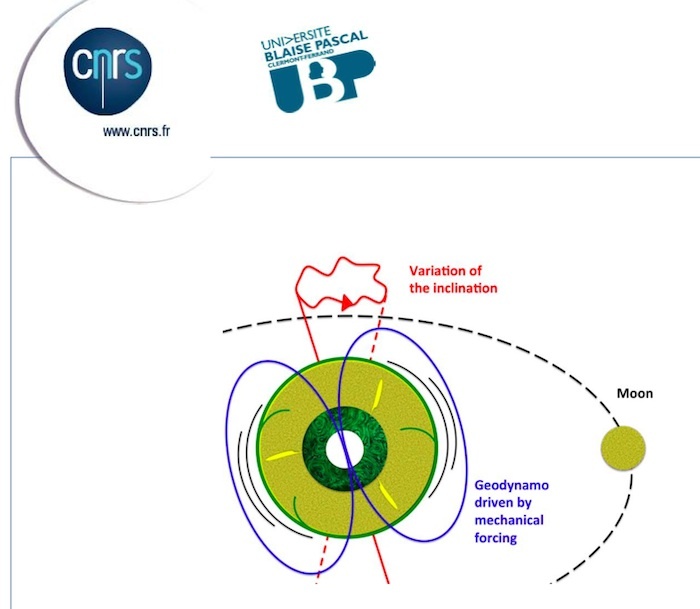 The action of the Moon, overlooked until now, is thought to have compensated for this difference and kept the geodynamo active. Their work is published on 30 march 2016 in the journal Earth and Planetary Science Letters. The Earth has a slightly flattened shape and rotates about an inclined axis that wobbles around the poles. Its mantle deforms elastically due to tidal effects caused by the Moon. The researchers show that this effect could continuously stimulate the motion of the liquid iron alloy making up the outer core, and in return generate Earth's magnetic field. The Earth continuously receives 3 700 billion watts of power through the transfer of the gravitational and rotational energy of the Earth-Moon-Sun system, and over 1 000 billion watts is thought to be available to bring about this type of motion in the outer core. This energy is enough to generate the Earth's magnetic field, which together with the Moon, resolves the major paradox in the classical theory. The effect of gravitational forces on a planet's magnetic field has already been well documented for two of Jupiter's moons, Io and Europa, and for a number of exoplanets. The gravitational effects associated with the presence of the Moon and Sun cause cyclical deformation of the Earth's mantle and wobbles in its rotation axis. This mechanical forcing applied to the whole planet causes strong currents in the outer core, which is made up of a liquid iron alloy of very low viscosity. Such currents are enough to generate the Earth's magnetic field. © Julien Monteux and Denis Andrault.